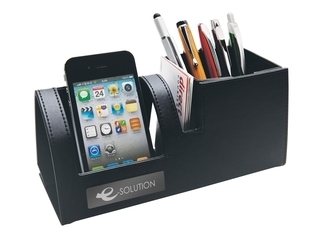 This stylish desk caddy ensures everything remains in place until needed. With place for a mobile phone, business cards and pens, its metal accent plate is the perfect spot for your engraved logo. Supplied flat packed. Product size is 20cm wide x 9cm high x 7.5cm deep.